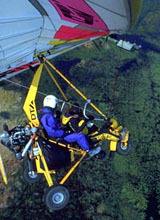 Trike type microlight using weight shift controls and a delta Wing. 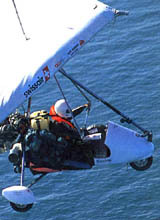 Rainbow Aircraft manufactured the Aerotrike in South Africa and was model was specifically designed for the Cape to Cape Expedition. Designer and manufacturer: Mike Blyth. Engine: 80 hp Rotax 912, 4 stroke, 4 cylinder, 1200cc, air & water-cooled. Wing: Spirit 16, designed by Mike Blyth.Wing span: 10 metres, wing surface 16 Sqm. Tanks: 2 x 45 litres (12 gal) fixed and 2 x 25 litres (7 gal) removable. Propeller: 3 bladed carbon DUC. Cruising speed: 80 kph (50 mph). Maximum speed: 125 kph (80 mph). Range: between 8 and 13 hours. Trike type microlight using weight shift controls and delta wing. The Voyageur 912 is manufactured in France and was initially designed at the beginning of the 90's for agricultural purposes as a crop sprayer. It soon became the perfect tool for media coverage and air-support during various African car rallies, but above all, an incredible adventure machine made for the roughest conditions. Designer & manufacturer: Jean-Michel Dizzier and DTA. Wing: Synairgie Jaguar 18. Wing Span: 10.5m. Wing Surface: 18 Sqm. Tanks: 85 litres (22 gal) fixed and 2 x 25 litres (7 gal) removable. Cruising speed: 80 kph (50 mph). Maximum speed: 105 kph (65 mph). Ballistic recovery parachutes on both aircraft, GPS navigation systems, engine monitoring systems, navigation instruments, navigation charts and road maps, Kevlar helmets, 2 way airband radios, strobe lights, life jackets for sea crossing, emergency beacon, tents, sleeping bags, cooking equipment, water canisters, first aid kit, survival kit and rations for 5 days, engine spare parts and a complete spare propeller, tools, bolts and screws, still cameras and video cameras.